some kind of scrap yard bases. I'll scratch build them. It shouldn't be too difficult as the larger the models is the more detail will be put into it. The boys will will just have less involved bases. I'm thinking plastic stock, quark board, dirt and what ever else look appropriate. And here are a few of the better pictures. 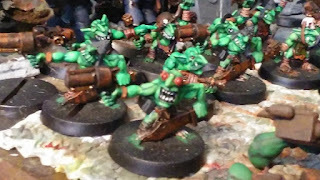 There are 28 of these little grots. Not sure where the last two ended up. Probably eaten. In my last game the warphead had the idea to put da Jump on my mob of 30 grots. This would have gotten them killed except for realizing there was a better spot to put them. They would go on to pop a bunch of shots at some flying Beakies. the final tally would be 2 Beakies dead and one wounded. he was cooked by some burna boys just after that. I have another 20 or more that will be going along with these. work work work! Their gunz are as large as they are! More Kannons! this will make 6 in total. I need to bring in one of the others to match them. I have a few Burna Boys in Bits I may build and paint as well in a month or so. I would like to get through these before I mess with those. The rust did come out well. it's just my usual dark brown + rust color but this time with a wash of gunmetal grey. That's gone dark, it used to be much brighter. I've had it for a while and maybe the pigment is separating? Who knows. I'm going to have to scrounge around for the stuff for the bases. I think they'll turn out nice. Good, wonderful, excellent, terrible news! I've finally got some pictures to show! Finally. Until yesterday I've had no inspiration for these guyz. For some reason I decided these Flash Gitz needed to be Deff Skulls I've never painted any before. I think even though there isn't a lot of blue it did come out consistent with how the rest of my models are painted. The storm boys are also done. I need a better picture of them. This took too long and I have no real reason why that was. 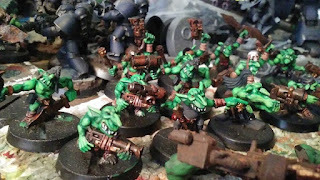 I may get another box of Flash Gitz next year and I think I could use 4 or 5 more storm boys, giving me 60 of them. But it's for later. I still have 20ish storm boys that I haven't painted and need to. I spend too much time mucking about with the panzy project which has just irritated me. The only real good to come from that is getting things out of my system and picking the colors I plan to use for the project. those models were all over the place. My friend was asking what colors I used. I told him...all of them. Yikes but that's just not working out. The face paint is spot on. It adds to the figures without being the only thing you see. Well done! I suppose I've said this before, but your rusty metal effect is just fantastic. I have difficulty enough doing half as good a job on vehicles, let alone guns and shoulder pads on boyz. 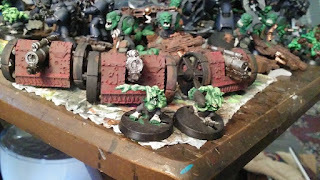 The pink is also a nice touch that we rarely see on orks. Hopefully this means you've regained your mojo now! That rust is super easy to do. Just get a ratty brush and some light rust color paint and stab it on over a dark brown base. The stab on some metallic. Give it a few washes Black wash, brown wash. Maybe an ink. Then add a few spots of color. and extra rust if you want! The Pink is a magenta air brush paint over white. some where I have another one that I was using that comes out a little better. The war paint came out just about right, not too clean not to messy. I hope my mojo is back. haha. Here's a few of the latest 10 storm boys. 15 painted now and 9 more to go. Here's 4 more burna boys. I still need to finish the 30 arrow boys for my Bonesplitterz tribe with luck I've lined an AoS game up for next Thursday when my scrumgrod will be able to play, He's driving up from Tampa for a few days. I think he moved there so he could beat me in a game of who has a longer drive to the shop... Yikes. This Sunday coming up I have a game lined up with my other scrumgrod( scrumgrod number two.) who just bought my space wolves collection from me. so I have to go loose a game so he feels good about having bought them! No, really I'm going to try my best to wreck face. And I'll use the mist I have posted in the Army list section. But I'm thinking about trading out two smasha Guns for 2 bubble chukkas, just cause. But the less changes I make the better, far too much work, all that 'the maths". A team of boars & a caisson would make it look like a real battery of guns. Who knows anything could happen this edition. I'm sick this week and today has been the worse so far but I expect I'm saying that too soon. Murphy runs more than the ARMY after all. I'm listening to GWAR's newest album and thinking about sending them my old art work from High School. One of the projects I did was an album cover front and back including track names. Maybe I'll give it to them one day. I've been looking for a mat for my game table, something I can make terrain to match. I'm thinking about 6-8 new terrain features and scrapping my old stuff. Just posting to say Happy New year. I've not been working on anything Ork related in over a month or more now. Too much going on. I'm back into 30K mode right now in my free time and I expect that to be the case for another month after which who knows. I'm planning to sell my AoS Bonesplitterz this wear. I really like them but I want to start a new project for AoS this year, probably near May. I also want to gift some money to one of my good friends who is in need right now. His wife in in the hospital and it's going to be a rough ride for them for probably a few years or more. Other than that I'll be saving up for the Ork codex and new models, when ever that is and have already been asked to take a small commission some 80 to 100 models, all infantry or heavy weapons. No idea when I'll have that come in but I'm already plotting out how to paint them. That's about it for now. Happy New Year! I put this in the wrong post on the wrong subforum had to move it. Trukk 1 Nice and dirty! 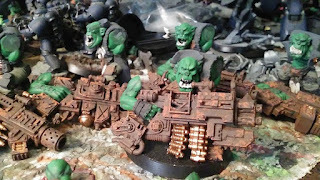 GorGak now had a Kill choppas - the relic Big choppa. Mighty GorGak later picked that powerful choppa from the corps of the slain and apparently weedy warboss who had died in the car "accident". Any who We'll be back! This is the first 10 of them. It'll be a little while until they're ready but it's finally a start. It will take as long as it takes. I was thinking I might make molds and cast them but I may just keep building them. I haven't decided. if I get sick of making these them I may cast them. I'm going to see how many I can make first. The last bases I cans I made 30 or more all different bases so I wasn't just using the same 10 in rotation. Progress on the bases we're up to 25 of them now. Coming along nicely. I also have some razor wire I can add when I am ready to mount models to these bases. Just a little I think. I have no idea just yet how the Ork will fit on these but plan to pin them on when the time comes. Need new drill birz first. I keep snapping them. bad luck. 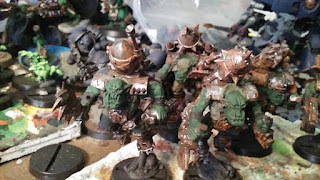 8th edition and the return of WAAAGH GorGak!